On Friday (January 24), I was cleaning up after lunch when Lopez knocked on the door and motioned me to follow him quietly. I followed him outside around the pool and he pointed into the trees where there was a Spider monkey jumping from tree to tree! I ran back into the house to get my little camera. The monkey stopped on a tree not far from us and I managed to get a decent photo of him. 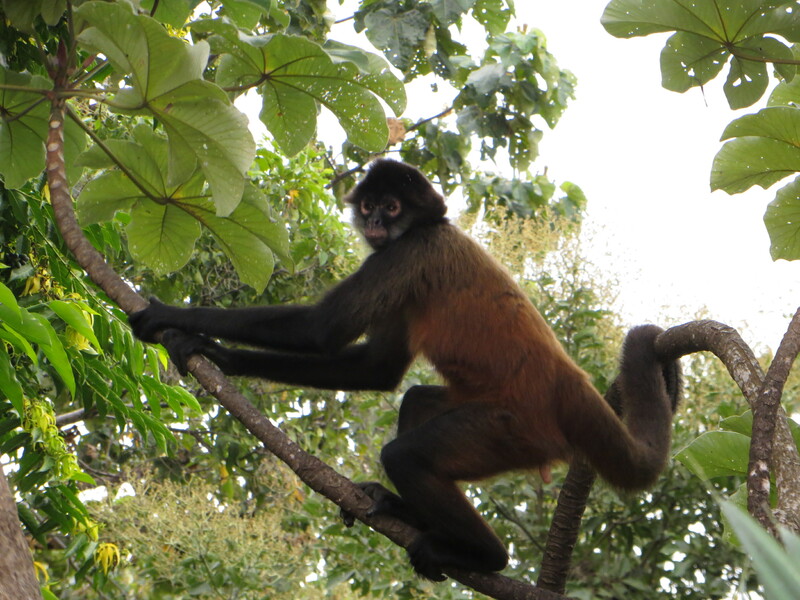 It’s amazing how the Spider monkeys swing around using their tails. They are a lot of fun to watch, that’s for sure. 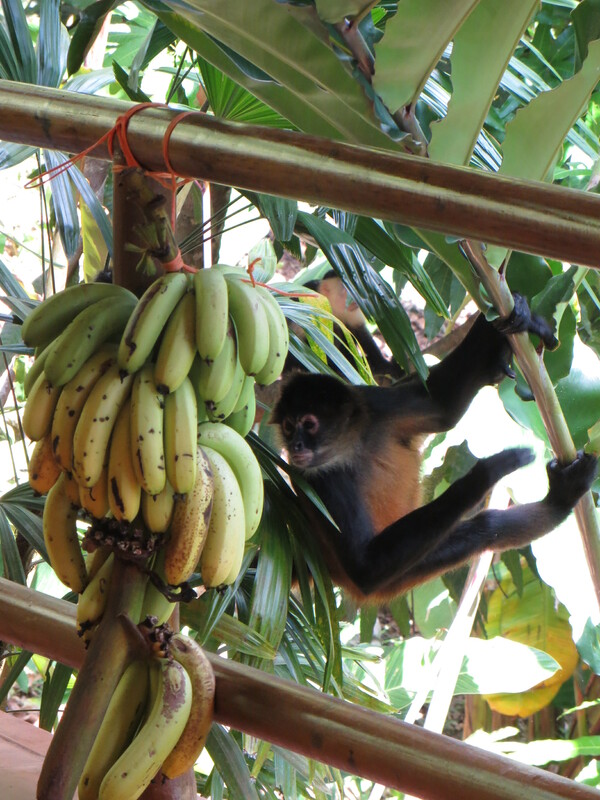 It didn’t take us long to figure out that the Spider monkey was headed for the bunch of bananas that Lopez had hanging on the lower railing of the terrace across from the laundry room. Suddenly, I remembered that Eddie was taking a shower and I dashed into the house to alert him about the monkeys. Eddie had finished his shower and rushed to get his camera. We managed to take some wonderful photographs!!! Before we knew it, more monkey’s were coming to eat the bananas! 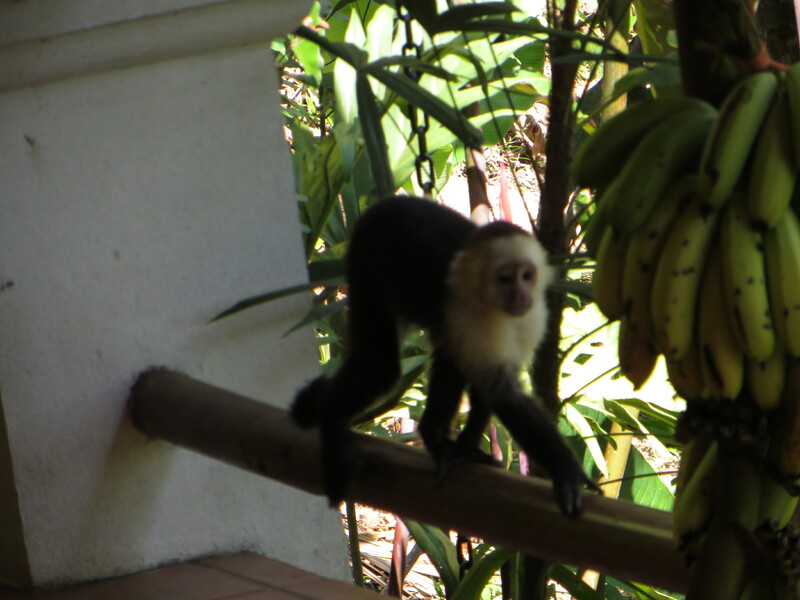 It was a large tribe of White-throated Capuchin monkeys and they chased the Spider monkeys away. The Capuchin are really cute! Not only that, they are very brave. Several of them including a mama with a baby on her back came right up onto the terrace and grabbed some bananas. They knew we were close by, but the temptation of food was too overwhelming and they took the risk to grab it. We really enjoy watching them…they were so close that we could see the expressions on their tiny faces! close by. Fortunately, I had my little camera and got a great picture of him. 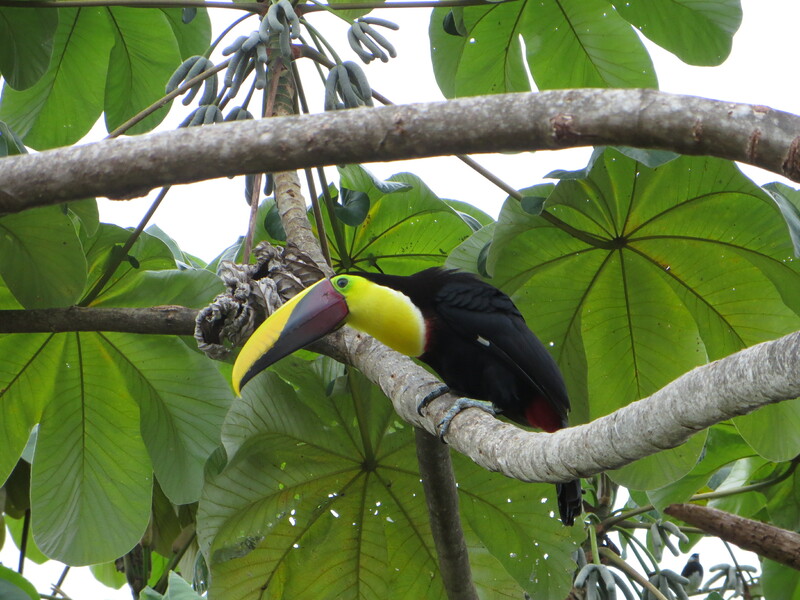 The Toucans like to eat the little berries that the Cecropia trees produce. Hi Ellen – Just now got a chance to read your blog and enjoy the pictures. What a beautiful place! We missed you at PEO last night but you’ll be glad to know we are going to carry on with the Belk’s fundraiser. As you enjoy the warm sunshine think of us – snow and 17 degrees tonight. Watch out for the monkeys – I learned the hard way that they like to steal shiny stuff! Hi Kathy – Thanks for your message! Glad to know that I’m missed and that the Chapter is going to continue with the Belk fundraiser. Please tell how you learned the hard way about monkeys stealing shiny stuff!! !